"Social Media Examiner is a free online magazine designed to help businesses discover how to best use social media tools like Facebook, Twitter and LinkedIn to find leads, increase sales and generate more brand awareness. Technorati ranks us as a Top 100 Small Business blog (even though we service all businesses). Offering a unique single source of knowledge, the site contains comprehensive articles and videos on how to use the best social media tools, along with original case studies, reviews of the latest industry research and advice direct from the world’s leading experts. Our mission is to help you navigate the constantly changing social media jungle. Michael Stelzner, the site’s founder and executive editor, had a vision to bring together the brightest minds in social media. Mari Smith, Jason Falls, Chris Garrett, Denise Wakeman, Cindy King and Casey Hibbard answered the call as founding contributors". 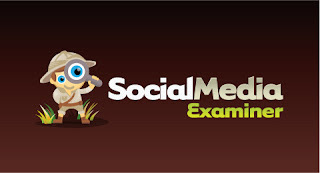 You can get Social Media Examiner delivered for free, straight to your email inbox. Well worth signing up for.